Keep your cool during warm weather months by keeping your air conditioner compressor clean with Permatron’s patented PreVent wrap around air conditioner filter. Air moving across your outdoor air conditioning unit contains contaminants like dust, dirt, pollen, leaves, pet fur and dryer lint. As dirt and grime collect on condenser coils, they restrict air flow and heat transfer, causing the compressor to work harder. Equipment operating with dirty coils can use 30% more energy than a clean system, reduce cooling capacity and lengthen the cooling cycle. An air conditioning system running at higher operating pressure and temperature caused by the dirty coils can also reduce the equipment’s life expectancy or cause inconvenient breakdowns and costly repair bills. A new A/C system in a 2,000 sq. ft. home can cost you $3,500-$4,000. Replacing a burned out compressor starts at $1,000. One size fits all. 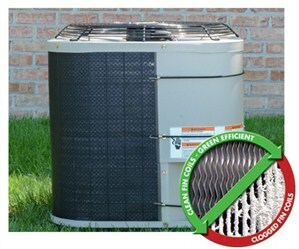 Simply wrap the UV protected PreVent filter screen on your clean unit, to keep it running clean throughout the season. Attach the filter in place with included bungee cords, and trim the filter to the size of your air conditioning unit for a neat, attractive appearance. You’ll see the dirt accumulate on the outside of the filter. Remove as needed and rinse with a hose, or clean in place with a shop vac or a brush. Permatron’s patented PreVent wrap around air conditioner filter is a washable and UV protected media, which traps airborne particulates before they enter your outdoor AC condenser and increase your energy usage.